DETROIT, MI, February 12, 2019 – – Founding member, songwriter, keyboardist and former lead singer of Styx, Dennis DeYoung, presented Dennis DeYoung: The Grand Illusion 40th Anniversary Album Tour at the MGM Grand Detroit in early February. Radio promotion of the Detroit concert featured national male voice over talent Peter K. O’Connell. 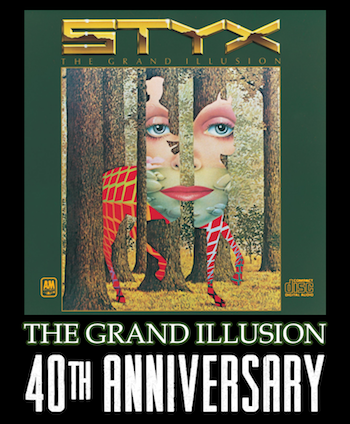 The concert and radio commercial highlighted DeYoung’s performances of all the songs from Styx’s The Grand Illusion album as well as other Styx songs performed and/or written by DeYoung including “Lady”, “Babe”, “Too Much Time on My Hands” and “Mr. Roboto”. The only Forbes Four-Star hotel in Detroit with the only Forbes Four-Star restaurant in Michigan, the AAA Four Diamond Award-winning MGM Grand Detroit is the city’s first and only downtown hotel, gaming and entertainment destination built from the ground up. The hotel features 400 chic and stylish guest rooms, including nine rooftop VIP suites and 56 opulent corner suites. MGM Grand Detroit is a wholly owned subsidiary of MGM Resorts International (NYSE: MGM). From Fortune 500 companies to companies that think $500 is a fortune, multi-award winning male voiceover talent Peter K. O’Connell has shared his voiceover and audio production skills with a wide variety of companies, world-wide. In addition to his most recent voiceover work for the MGM Grand Detroit, some of Peter’s commercial and narration clients also include L.L.Bean, IBM, Duracell Batteries, General Electric, Massachusetts State Lottery and Kraft Foods. O’Connell owns audio’connell Voiceover Talent, a division of O’Connell Communications, LLC. He can be reached via audioconnell.com or peterkoconnell.com.